The restaurant at our Castine bed and breakfast is open to the public and inn guests most evenings serving dinner or as we affectionately say “serving supper”. The renowned farm to table menu at our Castine, Maine restaurant offers the best of local fare complemented by an excellent wine list and specialty cocktail menu. You are Invited! Join us in our acclaimed Castine, Maine Restaurant. The restaurant and pub is open to inn guests and the public most evenings serving dinner or as we affectionately say, “serving supper”. Our dining rooms are intimate, casual by candlelight, graced with floral paintings, mismatched antique china, and garden flowers. On warm Maine evenings, there is a table for you on the porch, under the stars. The cozy tables in the Pub are a favorite spot for many guests. Experience our exceptional home-cooking that honors the classics with soulful simplicity, bowing to the seasons. Julie Van de Graaf, owner and executive chef, plans the menus around the remarkable ingredients available fresh from the local farms and waters that surround us. Offering lobster, local seafood and fish, speciality meats, gluten-free and vegan specials and fine desserts. There is a well-stocked wine cellar to complement our menu as well as a full bar and a specialty cocktail menu. Reservations are a recommended as we do get busy. Call us at 207-326-8616. 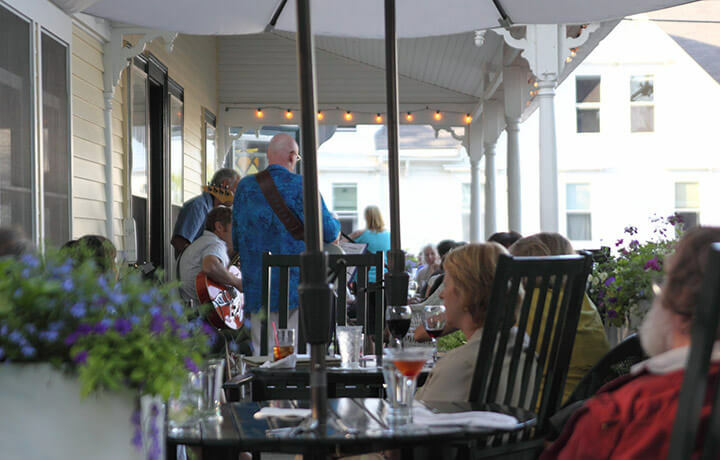 For the fifth year there will be a jazz trio on the porch Tuesdays July through September. Join us at this weekly event for drink specials, delectable small plates and remarkable music. 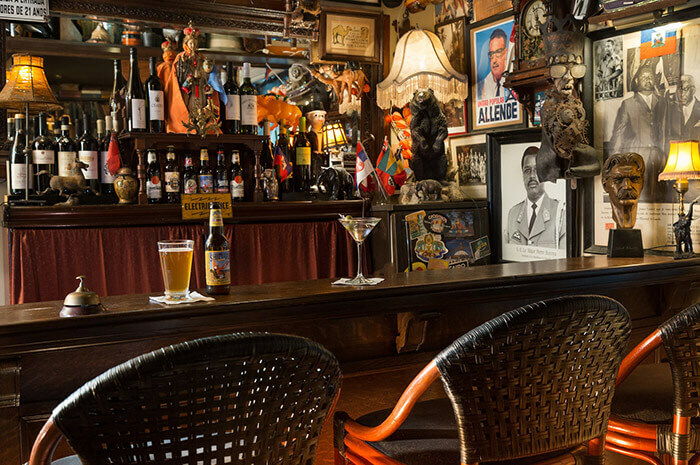 A cozy, old world hideaway with a small oak bar, the pub is an eclectic, ceiling-to-floor mix of vintage photos, paintings and memorabilia from travels abroad. An early watercolor of Venetian gondolas hangs between a three-foot oil of Lenin unearthed in a Tajikistan flea market and a large sepia portrait of Gandhi, courtesy of the Indian embassy in Zaire. Our Maine bar was featured on the Travel Channel! Furnished with antiques, Malaysian rattan, empire sofas and slowly turning ceiling fans, it’s a room that celebrates storytelling and adventure. It fits well in a town whose colorful history is rich with political upheaval and foreign intrigue. The Baron Pub and Wine Bar is the perfect place to start your evening with a glass of wine or one of our signature cocktails. There is an extensive wine list, local and international beers, and a full bar. The pub has several tables for dining as well as late evening desserts and perhaps a “wee dram”. The Pentagoet, and specifically The Baron Pub and Wine Bar, was recently featured in the Maine Magazine article “Castine by Pentagoet”. The article’s author Sandy Lang writes, “I’ve long been intrigued by the Pentagoet and, particularly, its appealing first-floor pub…[we] decide to remain in this room for the rest of dinner talking of explorers, elites, scientists, czars, and scoundrels”. Read the whole story at Maine Magazine.